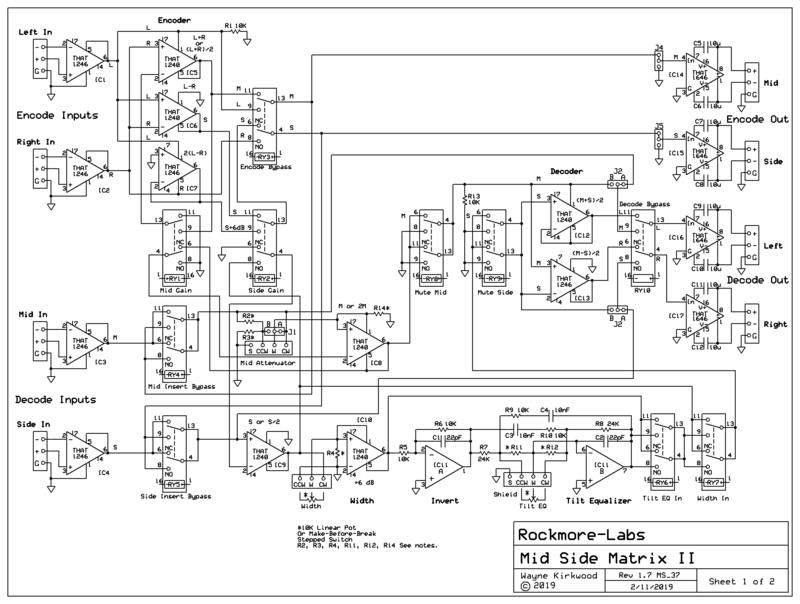 Using the Precision MS Matrix Encoder to Drive "A Mid Side Speaker Array For A Big Ambient Sweet Spot"
The MS Matrix is Offered as A Bare Circuit Board, PC Board with THAT ICs, or Assembled and Tested Shown Above. This is the new "MS-II" Matrix based on the original MS design published in the Pro Audio Design Forum and used by mastering facilities world-wide. The MS-II offers a number of new features including Mid/Side Gain Offset, Variable Width control, a Tilt Equalizer in Side and multiple Bypass modes. The Precision MS-II Matrix uses THAT1240 and 1246 line receivers with resistor matching of 0.005% to perform high accuracy mid-side sum and difference functions. Encode/decode crosstalk performance is typically >55 dB across the full audio band. The Precision MS-II Matrix provides simultaneous encode/decode capability. THAT1246 line receivers and THAT1646 OutSmarts® line drivers provide fully-balanced I/O for the encoder and decoder inputs and outputs. The MS-II has a number of new features to make MS easier. For those wanting a quick look, the schematics are here. M/S processing can often create level challenges for both outboard gear and internal to the MS matrix itself. Side levels are often significantly lower than Mid. With highly-correlated elements Mid often has "mono build-up" producing level increases of 3 to 6 dB. The MTC-MS-II addresses MS level challenges by applying switchable Insert Gain Offset between Mid and Side. The Encoder can operate with 0, 6 and 12 dB offset between Mid and Side. When gain offset is applied in the Encoder, the Decode gain is compensated to maintain the original M/S ratio. Mid Gain Offset: Reduces Mid Encode Gain by -6 dB. Mid Decode Gain is automatically increased by +6 dB to compensate. Mid encode headroom is increased by 6 dB. Individual Encode and Decode Bypass. The MTC-MS-II's Encoder can be bypassed to forward Left and Right into the Insert. The Decoder can be also be bypassed to forward Mid/Side to the final Left and Right Outputs or jumper-configured to forward the Decode inputs directly to the output. By using Encode and Decode bypass together the Insert can be switched from Mid/Side to Left/Right processing. Mid and Side have individual Insert bypass relays. Need to compress only Mid? Bypass the Side Insert completely. Processing both Mid and Side? Bypass one at a time to hear each processes' contribution. On-board relay logic is available to bypass Mid and Side Inserts simultaneously for instant A/B comparisons. The MTC-MS-II has on-board Width control ranging from 0 to 200% by varying Side Level from -∞ to +6 dB relative to an anchored unity gain Mid level. Control is smooth and predictable with a "feel" similar to the Width Controller using the LR±S method. A potentiometer or stepped make-before-break rotary switch can be used. The Width Control is relay-bypassed. On-board Tilt Equalizer Provides Frequency-Dependent Width. A gentle tilt equalizer can be inserted into the Side channel to provide frequency-dependent Width. The range at 10 kHz is +/-3dB. As 10 kHz is boosted, 100 Hz is decreased by an identical amount with a "pivot" frequency of about 1.2 kHz. A 0 to 6 dB range in frequency-dependent Width is available from the 100 Hz to 10 kHz with either positive or negative slope. Width can increase with frequency or decrease with frequency. The Tilt Equalizer follows the overall Width control and is relay-bypassed. Individual Mid and Side Mutes. Improved Encoder and Decoder Headroom. The MTC-MS-II eliminates Mid build-up and the resulting headroom reduction with Mid Gain offset. Internal encode headroom in Mid is increased by 6 dB. Though not fully-appreciated Mid Side decoding has additional gain build-up during Left and Right reconstruction. When M+S is added to M-S to produce "L" the actual result is 2L. The MTC-II avoids L and R buildup by using the THAT1240 and 1246 line receivers to provide summation without gain. 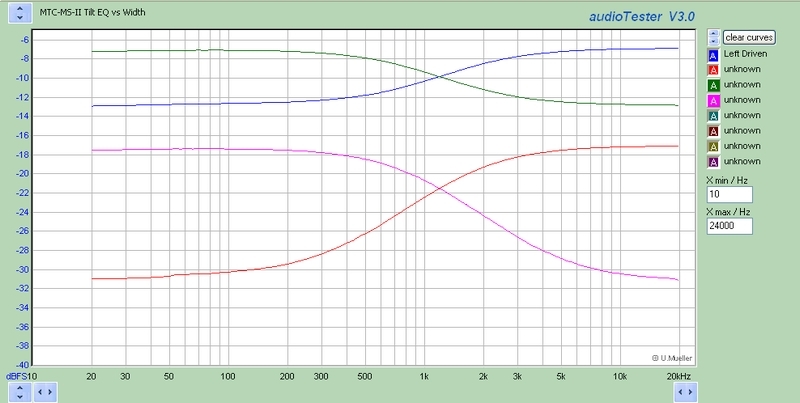 By switching the THAT1240 in a unique way its gain can be varied from -6, to 0 and to +6 dB. 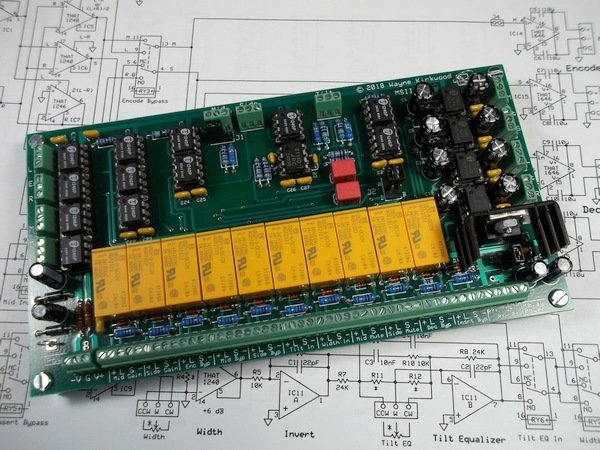 This provides the opportunity to provide switchable gain offset with high precision without the requirement for additional stages that would add differential phase delay to one process path but not the other. High frequency crosstalk performance is maintained. To learn more about the MS-II Precision MS Matrix visit the Pro Audio Design Forum. The Precision MS Matrix is sold as either a bare PC board, a "kit" including THAT1240, THAT1246, THAT1646 ICs and an OPA2134, or an assembled and fully-tested module. A Mouser Electronics Project Manager bill-of-materials is available for DIY builds of the Precision MS Matrix.